Mother's Day Giveaway: WIN a Dazzle Rug worth £60! Treat your mum to a gorgeous Dazzle Rug this Mother’s day by entering to win our exclusive Mother’s Day competition! Give your mum the gift of design! One lucky winner can take home a stunning Dazzle rug worth £60. This giveaway ends March 25, so you have six extra days to get her a great gift. We’ve teamed with Flair Rugs to giveaway an amazing Mother’s Day prize! Win a £60 Dazzle Rug in Mauve for your living room, bedroom or lounge. Celebrate your mum and give her something special (& personal) this year. We’re half way through March and now it’s time to start thinking ahead to future celebrations. Whilst you appreciate your mum all year round, Mother’s Day is the perfect time to show her just how much you love her. So what do you buy the lady who’s always been there? Whilst things like makeup and perfume make lovely gifts, nothing says I love you more than a piece of luxurious flooring. Rugs are something that will last and makes the perfect gift. 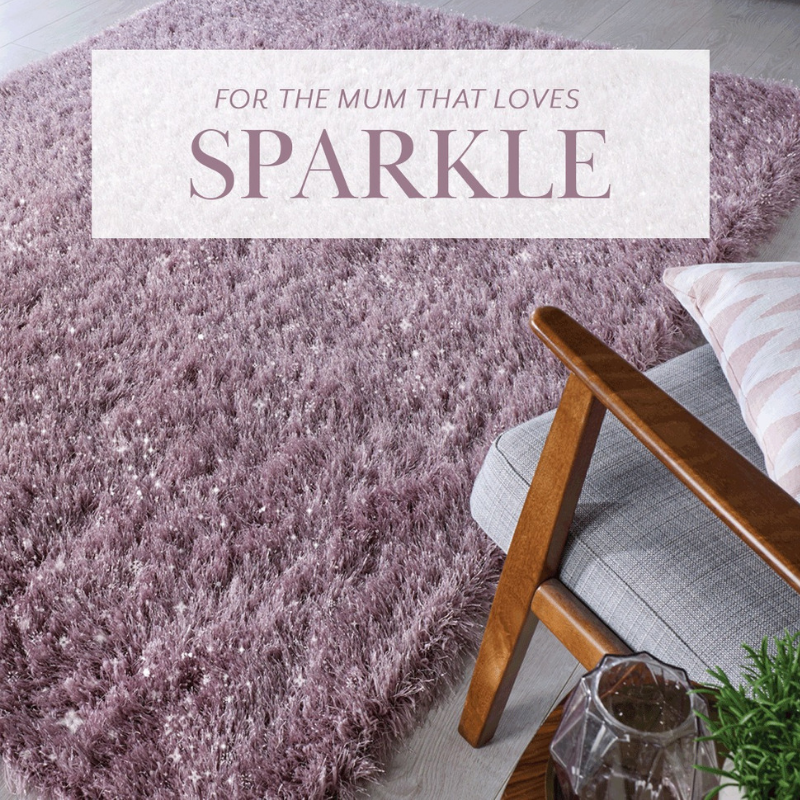 Win a Dazzle Rug this Mother’s day! Dazzle rugs are dazzle by name and dazzling by nature! The super soft, shimmering pile compromises of thick and thin yarns with a dazzling silver yarn which provides the added sparkle. Power loomed with a silky soft 100% polyester yarn to create a deep thick pile which will bring a touch of glamour to your interior. Colour: Mauve. Size: 120x170cm (4’0″x5’7″). Material: 100% Polyester. Our customers voted for their favourite designs and our Dazzle Rug was a clear winner! Take a look here. How can you enter? Fill out the form below, agree to the rules and register before 11:59 p.m. EST on March 25, 2019. Remember, you can get extra entries by sharing with your friends and family. Good luck! There are plenty of options which will get you more entries. Please note if you do not complete the mandatory entries and you’re picked as a winner you will be disqualified. The winner has 3 days to respond to the winning email, if we receive no response after this time we’ll draw a new winner. Good luck! Can’t wait to see if you win the competition? Head to The Rug Seller to buy yours for £60.00. Between 15/03/19-25/03/19 one lucky winner will be drawn randomly, and their prize dispatched within four working days. This rug can not be exchanged for money. By entering the competition, the winner of the Dazzle Rug agrees to allow The Rug Seller to use their name for publicity purposes – this activity may be used across social media and on The Rug Seller’s blog. Wow this rug looks amazing! Wow love the colour of this rug would really set the room off. What gorogeous rugs! Thank you so much for running this fabulous competition. I would love to have this in my conservatory. It looks great! The kids would love to give this to their mum this Mothers’ Day. This Dazzle rug would be absolutely wonderful to win. I could really be doing with a rug in my living room and since I am a busy fun Mum I think I deserve one hehe. Their rugs look amazing! Thank for a fabulous giveaway. I’d love to win! It’s such a pretty rug and would add a splash of colour to my bedroom, which currently is ALL grey and silver! Thanks! Mauve is my Mums favourite colour! fab giveaway! would be perfect in our home! It’s so Fluffy! I would love to put my Toes on this. Love this stunning, sparkling rug. This is gorgeous, what a great idea for a gift! My Mom would absolutely love it, thanks for the chance to win. What a wonderful prize! Such a lovely colour. Beautiful colour , would look fab in our living room. Love the rug, it would match my living room perfectly! The rug looks so soft, like your toes would sink into it! I’d love to add a bit of colour and sparkle to my very neutral lounge with this rug. I’m currently decorating my bedroom so a nice new rug would be great. This gorgeous rug would be just perfect for my bedroom. Gorgeous rug, I can imagine my grandchildren playing with their toys on it! This would really set the room off. This rug is simply beautiful. Lovely gift ,for Mum on Mothers day. This is the perfect rug for my niece Laura. She loves sparkle, and this is also her fave colour too! This would be so gorgeous in my home office or in the spare room! This rug is beautiful, Fingers crossed. Oh wow, this would look amazing in my lounge!! Would be so luxurious to step onto when getting out of bed in the morning! Gorgeous colour, perfect for my bedroom! Would add a bit of glamour to a bedroom! The prize rug would fit in beautifully in my newly decorated bedroom! Great colour – very on trend ! This is rug is very glamorous! Would love to win!! Absolutely gorgeous rug that would replace our threadbare one perfectly. This would look fantastic in front of my fire in the living room, so soft! This rug looks beautiful, I would love to win it for my living room. Beautiful, Sparkly rug … love it!! Beautiful rug in a beautiful colour. Fingers crossed! Gorgeous rug and the perfect colour to match my daughter’s bedroom! Wow. I love this rug. I would love to win it. It’s a beautiful colour, I’ve never seen a rug that sparkles before. I’ve just painted my living room this colour. The rug would top the room off nicely. Thanks for the giveaway. Would love to add a bit of razzle dazzle to my lounge with this rug. I don’t own a single, solitary rug! I’d love to win this as it’s just not right is it? No rugs! What a lovely rug! It would certainly add sparkle to any living room! This is a fabulous rug. Such a lovely colour. Thank you for the giveaway. Oooooooh this looks lovely, I put it by my dressing table. Thank you. This would be a lovely prize to win! Gorgeous rug. Please count me in! exactly what im looking for to complete my bedroom – fingers crossed! Awesome. This would look lovely in my new family room. This rug is so beautiful. The colour is perfect for my Daughter’s room, she’d love it, too. A gorgeous rug. The perfect gift. Absolutely gorgeous rug! I would love one of these in my home.